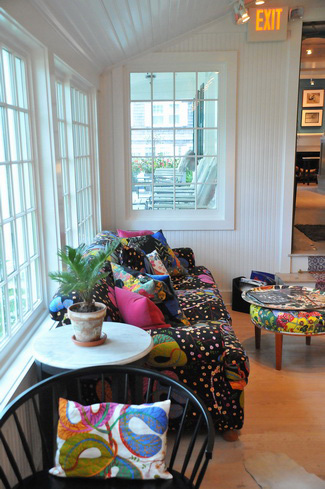 c/o The Maidstone, located in bucolic East Hampton, is a Swedish design tour de force. For design addicts and design junkies, it is a destination, a lesson in color, in light, in an eclectic historical and modern Swedish design. At the moment, this post was further down on my list of things to do, but as is true for all of my posts, they come when I am inspired, and I just cannot hold on to these images any longer, I need to share them! Nadia Tostoy, design director of c/o The Maidstone, desired to create a "Scandinavian cozy" theme, a historical yet modern environment. Inspired by Josef Frank fabrics, color is a foundation of c/o The Maidstone and the turquoise walls in the entrance and beyond immediately reach out to welcome a guest. C/o The Maidstone was purchased by Swedish hotelier Jenny Ljungberg, who injected a Swedish free spirit into the previously typical Hamptons "rustic chic" traditional spaces. I have had the pleasure of staying at the previous Maidstone Inn numerous times and this time we stopped by for a wonderful, lingering, breakfast, and the word "wonderful" is probably understated. This was last Saturday. As many of you know, I have a passion for Scandinavian design by connection to my own Danish heritage and visits throughout my life to my families' homes in Denmark and Norway, so this visit was eagerly anticipated. As all the guest rooms were booked, I did not have the opportunity to see any of them, but I will in the future. As I study the interiors with a critical eye, well, before that, let me say that my first impression was an incredibly positive WOW...gorgeous, exciting, beautiful! I WAS excited (and I certainly still am!) As I take time now to look at my images, as in any interior, the question comes to mind...does it look "designed" or does it look like a natural compilation of pieces, particularly in the sitting rooms? To me, it looks, for the most part, carefully coordinated. For me, the standard for the evolved look is the traditional English interior which always seem to give the feeling of each and every piece having been added at a different time, but it all just blends, all the "lite" eclecticism of it. There is much eclecticism here, but it seems much more controlled. A nitpik might be that I may have liked to have seen a bit less Josef Frank. Not less color, necessarily. All that said, there IS much to be said as well for a controlled design perspective in a space like this. Selecting a few prominent threads to play/work with such as color, Josef Frank's textiles, the shade of gray, as themes, create a flow which serves to connect many multiple seating areas and which in this case is very interesting. There is a free spirit running rampant within these design threads as seen in the art installations, gray sheepskin throws over crisp white traditional shelving, and more which, to my eye, break rules in a very positive way. The juxtaposition of the dark, dark gray wall color and the extreme white ceilings and walls is, to me, perfection, and note the shiny ceilings. The flooring provides warmth in a lighter tone and within those neutrals, color chaos reigns supreme. To my eye, the antique Swedish rag rugs (I own 3, buy them here and scroll down) play a very important part in bringing a slightly worn authenticity to the space. I may have liked to have seen a bit more of that concept, just a bit. The traditional elements of the furnishings are welcome and their sculptural lines add a sort of friendly feeling. In fact, the furnishings are filled with sculptural lines, often in bright colors, which add a whimsical, yet sophisticated, look. For more information on Scandinavian interior design, visit Avolli, and Willow Decor. Also do not miss Emmas Designblog and PurpleArea. The BIG question is, what sort of kitchen would you design if we were inspired by this interior? For Part II on this theme, I'll give you my thoughts...in the meantime, tell me what sort of kitchen you see here, and I promise I won't be influenced!